Dan De Vaul drove around his ranch at about 10:30 a.m., prowling the property like a wary guard dog in a Jeep Wrangler. THE ENFORCEMENT : Armed with a GPS device and a clipboard, county Registered Environmental Health Specialist Scott Milner and Supervising Environmental Health Specialist Rich Lichtenfels (not pictured) patrolled Sunny Acres on July 20 to survey domestic water wells and collect water samples for testing. 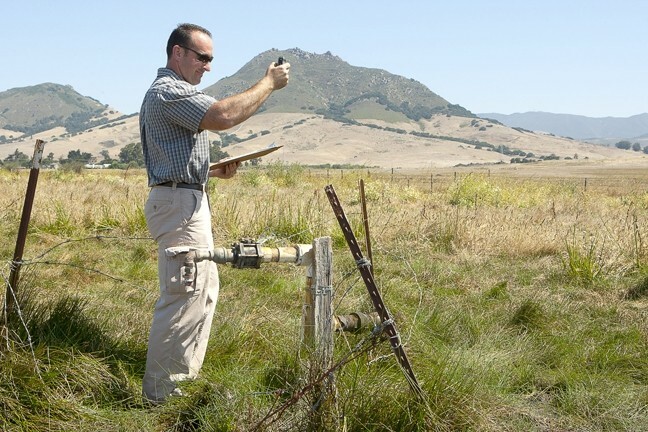 On July 20, he watched as members of the San Luis Obispo County Public Health Department descended on Sunny Acres—a working ranch and sober living facility outside the city of SLO—to survey the domestic water wells there and gather samples for testing. “Per the court order, we are surveying the property for wells, and we’ll be taking samples at each of the facilities by the end of the day,” Supervising Environmental Health Specialist Rich Lichtenfels told New Times as his partner, Registered Environmental Health Specialist Scott Milner, poked at a well on the back end of Sunny Acres. They were there because six days earlier, SLO County Superior Court Judge Charles Crandall reaffirmed a court order requiring De Vaul and Sunny Acres to clean up code violations on the Los Osos Valley Road property that has been deemed essentially unsuitable for human habitation. An order to address the code violations was first issued in mid-2010, but stalled after De Vaul and his attorneys appealed to a higher court. The appeal was overturned, and the order was put back into effect June 8, with Crandall setting a formal timeline on July 14. Water sampling is the first step toward enforcing compliance. The county found that Sunny Acres drinking water tested positive for bacteria about two years ago. De Vaul and his attorney John Belsher have argued that the county tests were a false positive, and their own independent tests showed no such problems. County officials never accepted those results. The next step will be to vacate people from the ranch’s structures, including a few small shacks that house many of the Sunny Acres residents and the dairy barn where people cook and eat daily meals. Belsher asked the court for some leeway, arguing that the county won’t allow Sunny Acres to apply for a permit for a new housing facility while code violations remain. Effectively, Sunny Acres residents need to be evicted before they can begin building a new place to live. De Vaul is scheduled for another court appearance on Aug. 25, at which time Crandall will determine, based on the county’s report, whether the code violations have been cleared.